I give trust to my employees at work a lot easier than most CEOs would. A lot of people struggle with giving trust freely because they fear micro-losses. When you trust someone blindly especially at work, they might make mistakes. If you’re driven by the fear of losing in the short term, you won’t find it that easy to “let go” and let the other person make decisions without micromanaging their every move. But building trust and giving it freely are both incredibly important parts of the equation when it comes to climbing the ladder in the corporate world or running your own business. The thing that really scares me is, often times the best way to get trust as a new employee within an organization is to pander to the judgment of senior leadership. It’s by aligning yourself with their point of view. But their point of view might not actually match with your own. For example, a common problem I see at big companies is executives and leaders deciding to spend a bulk of their marketing budget on things like billboards or television commercials. Many companies will struggle or go out of business in the next decade because they’re not adapting to the current landscape of advertising and attention. Toys R Us was just the preview. 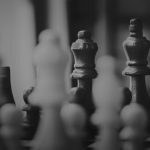 If you’re a new employee in a marketing role at an organization and you want to grow within the company, it would be easier in the short term to just align yourself with the POVs and decisions of senior leadership. Even if they go against what you believe. Personally, the advice I would give would be to “die on your sword” and bet on winning in the long term. If you express your authentic point of view and disagree with the people “above you”, you might “lose” with many of the leaders within your company and it might stifle your growth within the organization. But you’ll win over the smart people in the company, especially when they leave and move on to other organizations. I have empathy for those who decide to pander to the POVs of senior leadership to move up within a company, but expressing your honest opinions respectfully and being historically correct will help you more in the long run. Many times, you’ll make more money and get more accolades in your career if you don’t immediately grab what’s right in front of you. On top of that, there’s always someone watching – and you’ll always have to worry about what they’ll say or do after they see you do something unethical. For example, I have an assistant with access to my emails. He’d know immediately if I did something unethical or shady, and then he’d question everything I’ve ever said to him. Not only would that be devastating to the kind of impression I’m trying to leave, but it would also slow us down. Healthy company culture is built on trust and openness, and even though there can be healthy debates, there should be never any question of anyone’s intent. 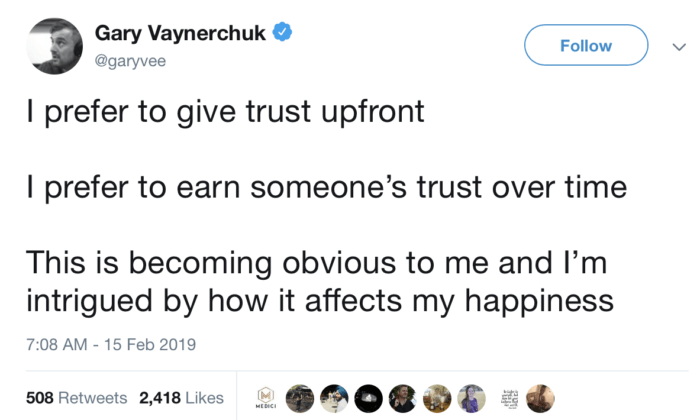 The same thing applies if you’re trying to level up your career within an organization and get promotions – sacrificing your ethics to get what you want might “work” in the short term but it will leave you in a very vulnerable position over the course of your career. A lot of managers and people within organizations struggle with giving the people they work with the freedom to win or lose on their own. To me, “ultimate scale” is allowing people to roam free and expose themselves. By giving people a “blank canvas” to express themselves on, I’m able to get a true read on someone and who they are. I tell my team all the time that I trust them blindly. And I will continue to do so until they do something that makes me take away that trust. If they have questionable intent or if they prove that they’re not capable of handling the challenge they’ve been given, I might take away that trust and put restrictions around them. But I operate on a different playing field than “trust is earned.” I believe that trust is given first. Who am I to have it earned? Some people will take that “rope” and create enormous happiness and wealth in whatever we do together, and others will get tripped up in that rope and lose. A big part of being a leader is being the bigger person – in every situation. It means “giving” even when you don’t get anything in return sometimes. It means taking ownership and accepting blame. You can’t simply impose your will because you’re now the boss. There will be plenty of times where you will need to swallow your pride and do what’s in the best interest of the team. This means empowering those around you to do their jobs, but it also means something else: you need to be able to accept that certain things are your fault. At the end of the day, you’re the one leading the charge, so you need to be willing to accept responsibility for your successes, and more importantly, your failures. No one likes a boss that passes the buck to an employee in a tough situation. If you take the blame, your people will know that you’ve got their back – no matter what the situation is. Even though I give trust up front, I prefer to earn other people’s trust over time. It comes down to giving without expectation. I trust and empower other people, but I’m not crippled if someone doesn’t trust me at first. When people watch my content for the first time, they might be confused when it comes to my intent. But over time if they keep listening and consuming my content, they’ll slowly begin to understand my truths and what I really stand for. The same thing happens in corporate America. One of the toughest decisions I’ve had to make was the decision to “put myself out there.” I knew that the “establishment” might not respect my self-promotion and that it might somehow undermine my success as a businessman and operator in their eyes. But I wanted to stick to my truth – and over time, many of them have come around. I give trust to others, but I don’t expect it at first – and it’s a big key to my happiness.